Bavaria, 35 kilometers northeast of Munich, and one kilometer north of Moosburg (48 / 27 North Latitude, 11 / 57 East longitude). 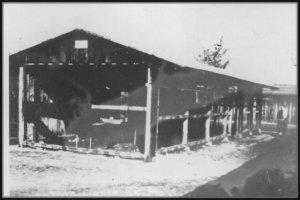 This installation served several purposes: It was the camp for NCO's of the U.S. Air Force until 13 Oct. 1943, when all 1900 were transferred to Stalag 17B. It was the transit camp from which officers and men of the ground forces, captured in Africa and Italy, were routed to permanent camps. It was headquarters for working parties of ground force privates ( who numbered 270 in Sept. 1943, and rose to 1100 in July 1944). As Germany collapsed in the spring of 1945, it became the final gathering place for no fewer than 7948 officers and 6944 enlisted men moved from other PW’S camps. Situated in a flat area surrounded by hills, the camp was roughly a square divided into 3 main compounds, which in turn, were subdivided into small stockades. The NORDLAGER held newly arrived PW’S two days, while they were searched, medically examined and deloused. The SUEDLAGER held only Russians. The HAUPTLAGER housed PW’s of other nationalities: French, Polish, Jugoslav (Serb), British and American. Although nationalities were segregated by compounds, intercommunication existed. No effort was made to keep transient American PW’s from the permanent inmates. 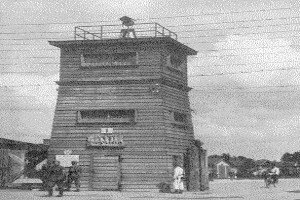 Seven guard towers and the usual double barbed wire fence, formed the camps’ perimeter. Barracks were rectangular wooden buildings divided into 2 sections, A and B, by a central room used for washing and eating. In it were a water faucet, and water pump and some tables. The barracks chief and assistant had a small comer room to themselves. PW’s slept on triple-deck wooden bunks and gunny-sack mattresses filled with excelsior. Gradually the number of men per barracks increased from 180 to 400. Men slept on tables, floors and the ground. 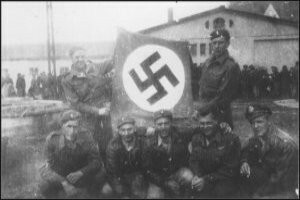 The guard was drawn from the Fourth Company of the 512th Landeschuetzen Battalion. Four officers and 200 men were employed on general duties. Ten Sonderfuehrers with the rank of officers acted as interpreters. 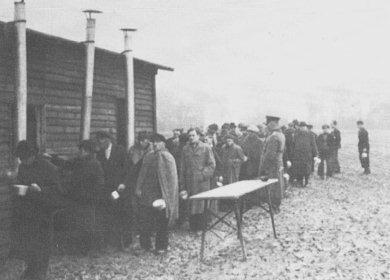 Twenty civilian men and 20 civilian women were employed as clerks in the camp. This complement was increased in April 1945 , with the arrival of the entire camp staff and guard personnel of Stalag Luft 3, Nurnberg. 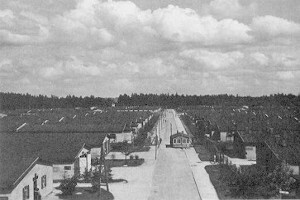 Control of the camp, however, remained in the hands of the regular Stalag 7A staff. It has been reported by some PW’S that Burger, Malheuim and Kluge, a fanatic of the worst sort, were shot 3 days after the camp's liberation. German treatment was barely correct. In addition to harsh living conditions caused by extreme overcrowding, instances of mistreatment occasionally cropped up. Thus, at one time the Germans tried to segregate all Jews among U.S. PW’s (calling them in from work detachments and allotting them a separate barrack). The MOC lodged a protest with the Protecting Power immediately. When questioned, camp authorities stated that the action was taken for the Jews' own protection, against possible civilian acts of violence. Eventually the attempt at segregation failed and Jews were not distinguished from other American PW’S. At the Munich Kammando, guards jabbed PW’S with bayonets and hit them with rifle butts. In the base camp, an NCO reported being kicked, then being mistaken for a Frenchman and choked during an argument; and later handcuffed after an escape attempt. Once an American, using a hole in the fence instead of the open gate, to go from one compound to another, was shot at but not hit. In April 1943 a Russian was shot on the compound wire and left hanging there wounded. An Englishman went to lift him off the wire and was shot, but recovered. The Russian died. In July 1943, 500 Americans without overcoats were forced to stand in formation for 5 hours in a heavy rain. The reason, said the Germans, was that the Americans had not been falling out at exactly 0800. During the first 2 weeks of August, the camp discipline officer had the PW’s fall out for roll call at 2100, 2400, and 0300. They were punished thus, because many Americans had been escaping. 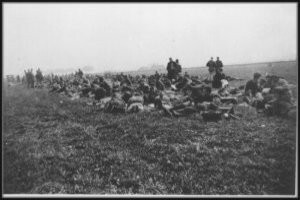 PW’s showed no annoyance and displayed such good morale that the Germans discontinued the practice, especially since both sides knew that the PW’s could sleep all day, but the guards could not. Sonderfuehrer Kluge once marched 1100 PW’s for a whole day, without food, through Nurnberg, so they could see the devastation wrought by Allied bombing. In Sept. 1943, when PW’s ventured out of the barracks to watch the bombing of Munich, Germans come into the compound with dogs, one of which jumped into a window and was stabbed by a retreating American. During the Regensburg raid, when PW’s were again outside their barracks contrary to orders, a German night fighter flying over the camp reported that someone in the American compound was signaling with a mirror. After that PW’s were notified that anyone outside the barracks during an air raid, would be shot. One night a JU 88, with lights on, made 2 runs over the camp and dropped cement blocks. Germans then started propagandizing to the effect that the Allies were bombing their own camps. Here too, PW’s depended on Red Cross food for sustenance and nourishment. Until Sept. 1944, each PW’S drew his full parcel per week, and a 2 months' reserve was kept on hand in camp. 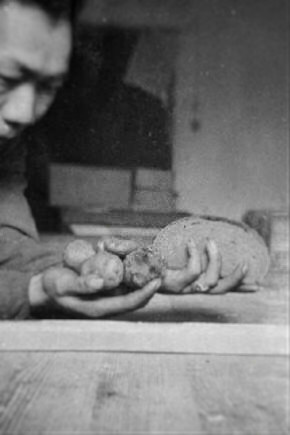 Then the ration was cut to half a parcel per man, per week and the reserve not allowed to exceed one month's supply. With the influx of PW’s in the beginning of 1945, stocks fell to an all time low. PW’s feared a complete collapse in the delivery of Red Cross food. Fortunately, this fear never materialized. In July 1943, the MOC persuaded the Germans to issue each man a spoon and crockery plate. Cooking utensils were improvised from whatever materials could be found. Fifteen or 20 men formed mess groups, pooled their Red Cross rations and took turns in preparing them. They cooked over the small barracks stove. Each barrack had 2 men on the chow detail, and the space around each stove was therefore quite crowded. At 0630, the detail brought hot water from the compound kitchen. Breakfast usually consisted of coffee and a few biscuits only. At 1130 they brought the German dinner ration, usually potatoes boiled in their jackets, from the kitchen. Sometimes spinach-type greens or barley soup were added. Five men divided one loaf of German issue bread. For supper at 1700, PW’S drew more potatoes. On Sundays they received greens with morsels of meat. Twice a week. they had a small piece of margarine. At first, French cooks prepared the food in the compound kitchen, but since Americans thought some of the victuals disappeared in the process, they later installed their own cooks. Health was good. 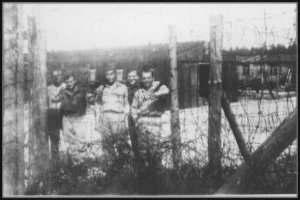 Several American doctors, captured early in the African and Italian campaigns, accompanied PW’s to Stalag 7A and were able to remain with them until their transfer to permanent camps. The camp also had some British doctors; and some French. Men reported to the dispensary and if deemed ill enough for hospitalization were kept in the compound infirmary, which could accommodate 120 patients in 10 rooms. More serious cases went to the German camp lazaret, outside the compound. This installation consisted of 8 barrack-type buildings, 2 of which were equipped for surgical operations. Allied doctors complained of a serious shortage of medical supplies. At first they used German drugs and such equipment as they could get. Later the Red Cross sent supplies, which alleviated the shortage but did not satisfy the doctors' demands. Despite delousings, lice and fleas troubled PW’s a great deal. Americans, however, unlike the Russians never contracted typhus. For a time they suffered from skin diseases brought about by uncleanliness; washing facilities were completely unsatisfactory and a man was extremely lucky to take a shower every 15 days. Latrines were always a source of contention between PW’s and camp authorities. Complaint was constantly made, that the pits were emptied only when they threatened to overflow; and that there was no chloride of lime to neutralize the odor, which permeated the surrounding area. Emergency dental treatment could be obtained in the German lazaret. Since the Germans issued practically no clothing and the flow of needy transients through camp was heavy, the clothing shortage was always acute. "The general condition of clothing is very bad. The American Red Cross should send out clothing in sufficient quantities as the cold season is approaching. Great coats and whole uniforms are badly wanted. The supply of uniforms issued by the Detaining Power is mainly old French or British uniforms in a state of mending which leaves no hope for long wear." 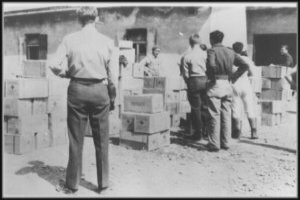 Clothing from the Red Cross did arrive, but not in sufficient quantity to provide for equipping newly captured PW’S. who were wearing only the clothes in which they were capture and sometimes not even those. It was observed by a Man of Confidence, that 4 warehouses in camp, contained many new English overcoats and battle-dress outfits, as well as many articles of American clothing taken from PW’s as they entered the camp or left it. These included aviators' leather jackets, American coveralls, combat jackets, pants, shoes, hat and shirts. It was believed by the Man of Confidence, that the clothing in storage was more than enough to alleviate the suffering of both American and British PW’S, yet all pleas and efforts to have the Germans ameliorate the situation were to no avail. The original group of Air Force PW’s - comprised almost exclusively of NCO's - was not or dared to work. 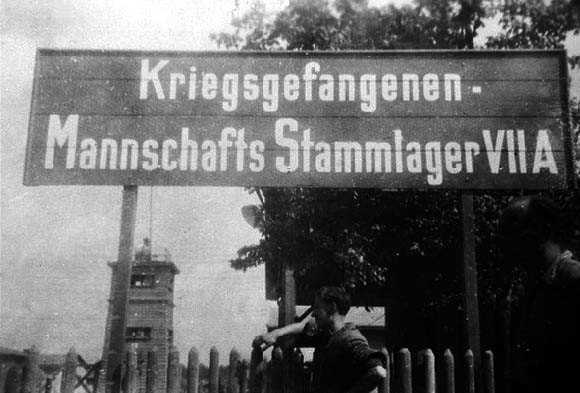 Nevertheless, before going to Stalag 17B, many volunteered for kommando duty, merely to get on the other side of the compounds’ barbed wire and have more liberty. On the other hand, Germans insisted that ground force privates be assigned to labor details. Camp authorities tried to have PW’s volunteer for duties - a practice which the MOC advised against except in the case of farm work, which was less unpleasant than other kommando duty. Attached to the camp were as many as 83 work detachments, ranging in size from four men (usually sent out to farms) to 900 men. The 3 main kommandos were situated in Munich, Augsburg and Landshut. After the heavy bombing of Munich on Oct. 1, 1944, a work detachment of some 1400 PW’S ‘s was formed. This party consisted of 60% Americans and 40% British. It left the Stalag at 0500 and returned at 2000. PW’s traveled in cattle cars from Moosburg station, standing up all the way to Munich and back. The time spent in the train going to and returning from work, was 3 1/2 hours. During their 8 working hours a day, PW’s cleared debris, filled bomb craters and dismantled damaged rails. 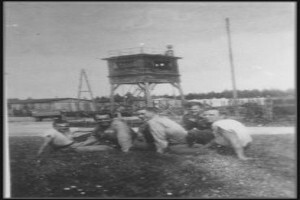 Men received 2 meals at Munich and their regular ration at the camp. In the event of air attacks, adequate shelter was provided. There were instances of Germans pricking with bayonets and hitting them with rifle butts to make them work faster and harder. A model farm Kommando was described as follows: Twenty PW’s live in a farmhouse of 5 rooms; including a room with a stove for the cooking of Red Cross food. They sleep in 3 of the rooms in double-tier beds with straw mattresses and eider-downs. Bathing and toilet facilities are primitive but similar to those used by their employer. The men sometimes eat with the farmer for whom they work and their diet, supplemented with Red Cross food, is good. Medical supplies for minor injuries are on hand and a civilian doctor takes sick parade twice a week. PW’s each possess 2 work uniforms, a dress uniform and 2 pairs of shoes. Fourteen of the men are free on Sundays; the others do the essential farm work, namely feeding cattle and cleaning stables. Razor blades, beer and matches are available. PW’s have neither time nor facilities for sports. The mail situation is satisfactory, except for the pilfering of parcels in route from the stalag to the detachment. On only 3 occasions was the Man of Confidence permitted to visit kommando camps for inspection. Although he turned in complaints, no improvement in conditions resulted. In March 1943, it was reported that the matter of paying officers had not yet been settled between PW’s and camp authorities. In the same month, an American enlisted man on kommando was paid the equivalent of $13.00 a month. Another worker revealed that the wage rate was .70 Reichmarks a day. In July this was increased to .90 Reichmarks a day. In April 1944, an advance of 50 Reichmarks was made to officer PW’S of the Allies, but in April 1945, the Senior British officer stated that officers were not being paid and that they had not received any pay statements for 7 months. Similarly, the 1400 man kommando working daily in the debris of Munich, was not paid because the labor performed by them was considered, by the Germans, to be "emergency" labor; to which anyone resident in the Reich was subject without pay. In Oct. 1944 it was announced that PW’S pay, which up to that time had been in camp money or "lagergeld" would henceforth be in Reichmarks. During their stay at camp, transient PW’s were allowed to send 1 postcard, usually their first, in which they informed next of kin of their German PW’S number and address. PW’s permanently at 7A drew 2 postcards and letter forms per month. Incomming mail, censored at camp, was unlimited in quantity but sporadic in arrival, especially at kommandos, which received no incoming mail for months at a time. Both outgoing and incoming letters took 4 months in transit, as did personal parcels. The flow of such parcels was light. On 10 Nov. 1944, four French PW’s were employed to unload coal into a bunker of the German barracks situated in the vicinity of the camp. They found that a large number of both official and private letters and cards were scattered in the coal. They picked up several loose letters as well as bunches tied together in small packages. Part of the latter included official letters addressed to the spokesmen of the different nationalities represented in the camp, coming from the Red Cross, the YMCA and other organizations. The next morning, the French, British and American spokesman went to the Commandant's office to protest and demand explanations as well as the restitution of the mail after inspection of the bunker in question. The following day, the camp commandant made it known that he would take charge of the affair personally. After a hasty censorship, a considerable number of letters ( 2 sacks weighing 88 pounds apiece) were delivered to PW’S. Them letters dated from the months of May, June and July 1944. It was impossible to say how long they had been in the coal. The commandant stated that an error had been made and that punishment would be inflicted, but that no letter had been burned. The assistant American MOC was under the impression that mail - including outgoing letters - definitely had been burned. This impression was strengthened after the incident when the Germans issued additional new letter forms. Initially morale was high. Air Force NCO's repeatedly made breaks from camp, and before their transfer to Stalag 17B, showed their hostility toward the Germans by often refusing to salute, by failing to come to attention when a German officer entered the barracks and by their careless, slouching, hands-in-pocket walk. 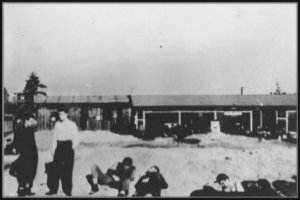 After their sojourn in camps in Italy, ground force PW’s captured in 1942-43 were pleasantly surprised by the treatment accorded then in Stalag 7A which had been a model camp for several years. 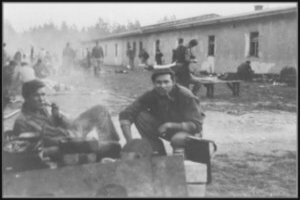 In spite of a succession of able camp leaders, morale slumped when the camp grew so crowded that PW’s had neither decent living quarters, nor satisfactory sanitary facilities nor sufficient clothing. Early in 1944, the MOC reported that stealing among PW’s was common and that fights were inevitable. However, except for a period of 3 weeks in Dec. 1944 the strongest morale factor , food, was available. 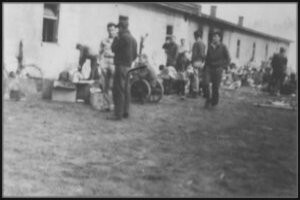 In the spring of 1945, although the, camp was more crowded than ever, morale did not slump. Red Cross food kept coming through and the arrival of officers with strong, experienced SAO's did much to prevent the spirit of PW’s from disintegrating. A representative of the Protecting Power made a routine visit to the camp every 6 months. In addition he would make a special trip whenever summoned. MOC's were permitted to talk to him privately, but despite oral and written protests about both veneral and specific affairs of the camp, very little improvement was ever effected. The representatives repeatedly said that his hands were tied and there was nothing he could do about it. One MOC felt that, the representatives were characterized by indifference, and inertia, until the arrival of American officers in the camp. Subsequently their attitude changed for the better. PW’s were indebted to the Red Cross for almost all their food, clothing and medical sup plies. While food parcels arrived regularly and in sufficient quantity most of the time, the camp suffered a constant clothing shortage since the stocks shipped from Geneva were not enough to equip the many thousands of transient PW’S who passed through the camp ever, few months. The first groups of PW’S arriving in camp reported the presence of recreational and athletic equipment which had come from the YMCA. Later, however, as the stalag evolved into a transit camp and work camp, need for such equipment was less evident and little was received. 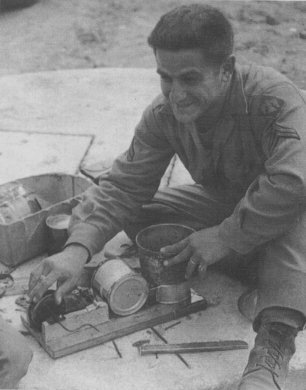 In 1943-44, camp chaplain was 1st Lt. Eugene L. Daniel, who won the admiration of both Americans and British. He had complete liberty to look after PW’s in the stalag, and once a month went to visit the 2 work detachments near Munich. He also received permission to visit the Wehrkreis PW’S hospital. In addition to Chaplain Daniel, Capt. Arkell of the Church of England held services for Protestants. Roman Catholics were permitted to attend weekly masses celebrated by French priests. Jews were for a time segregated in separate barracks. Otherwise they were not discriminated against. Nor were they offered any religious services.Conditions on kommandos varied. A few were visited by PW chaplains or attended local services, but most had no opportunity for religious observances. Before their transfer to 17B, the Air Force NCO's main diversions were baseball and bridge. They also played a good deal of volley ball. For a time they had a basketball court, but tore down the backboards for fuel. They also played horseshoes. A camp baseball league had many games between the "POWs", "Wildcats", "Bomber Aces", "Luftgangsters" and so on. At first they were allowed to use the soccer field behind their compound, a privilege later denied them. PW’S lacked sufficient space for recreation, especially toward the end when the compound was so completely overcrowded that Italians were sleeping in tents on the baseball diamond. The original study program included classes in Spanish, German, French, auto mechanics economics, bookkeeping, accounting, and mathematics. The YMCA furnished the books for these courses. A theater kept its 1943 participants interested and its audience amused. Plays were given in a room between barracks, and because of the limited accommodations, a show could have quite an extended run. The program was well arranged to provide continued and varied entertainment. One of the plays was Our Town". Another was one written by the director of the group and called, "Uncle Sam Wants You". The German censor cut some of the jokes from this piece, but he did not understand most of them. The camp commandant attended one performance. 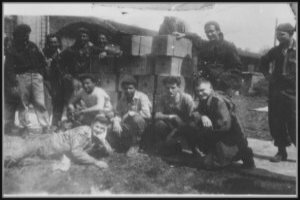 There were also a minstrel show and some singing performances When the camp became so crowded during the fall of 1943, a group of men used to go from barracks to barracks to sing each night. The band was short of instruments. In 1944 and 1945, conditions deteriorated. Ground force enlisted men indulged in little or no sports or recreation, either because there was too little equipment for the transients; or because as regular members of kommandos, they were too tired after the days work to play. 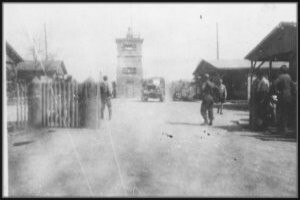 On 2 February, 2000 officers of the South Compound, Stalag Luft 3, reached Stalag 7A; followed on 7 Feb. by 2000 more from the Center Compound. 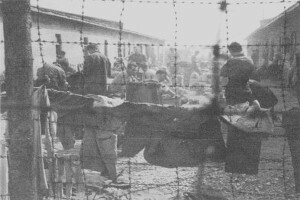 They were placed in the Nordlager, from which small groups were taken to be searched, deloused and sent to the main camp. 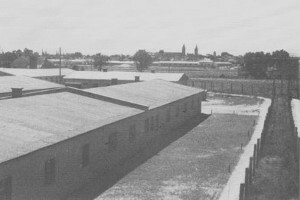 No facilities were provided for washing, sanitation, cooking and only straw spread over the floors of the barracks served as bedding. 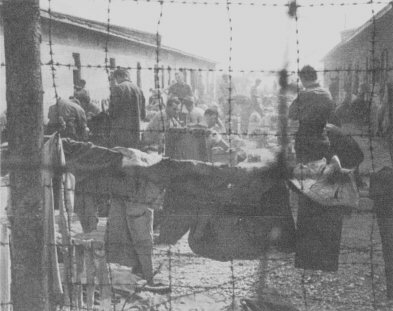 In somewhat less than a week, all personnel had moved to the main camps where conditions were little better. Over 300 men were housed in barracks normally holding fewer than 200 men. In order to provide bunks for this number in each building, the Germans arranged three-deckers, in groups of 4, thus accommodating 12 PW’S per unit. The barracks had no heat and as a result were damp, cold and unhealthful. The German administration was unprepared for the influx of new personnel and seemed completely disorganized. German rations were unbelieveably poor; no inside sanitary facilities existed and there was no hot water. The 2000 PW’S of the Center Compound were quartered in 2 adjacent, but separate stockades, some distance from the enclosure holding their mates from the South Compound. At the rear of the barracks in each of the 2 stockades, a small open area - barely large enough to hold the various units for counting - was available for exercise. Aside from this, no facilities were provided for physical training or athletics. Nor was there any recreational material, other than books in a traveling library provided by the YMCA. In March the Germans provided boilers and fuel enough to allow each man to draw a pint of hot water, twice daily. In order to improve the quantity and quality of German rations issued to Americans, Col. Archibald Y. Smith, SAO, made a continuous effort to place an American officer and several enlisted men in the German kitchen. This was finally accomplished 24 March and henceforward, rations improved steadily. The German administration also consented to allow groups of 50 men under guard, to gather small quantities of firewood in the area adjacent to the camp. These improvements, although falling far short of the provisions of the Geneva Convention, helped a great deal to improve the mental and physical state of all the PW’S. During all of this period, Red Cross foods (initially on a half-parcel basis) was increased to full parcels and the health of the PW’S remained remarkably good. By this time, too, news of the Allied advances acted as a tonic on the men. 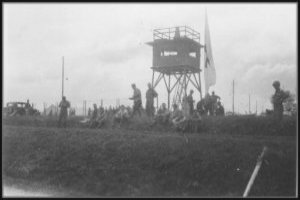 The first of April saw many PW’S from other camps throughout Germany, evacuated to the vicinity of Stalag 7A to prevent their recapture by Allied forces pressing toward the center of the Reich. This influx brought about a state of unbelieveable overcrowding and confusion. Members of the former South Compound were moved en masse into the enclosure occupied by the Center Compound. Thus 4000 PW’S lived in an area, which had been unable to support 2000 satisfactorily. Large tents were erected in whatever space was available; straw was provided as bedding. It was not uncommon to see men sleeping on blankets in foxholes. Col. Paul R. Goode became SAO upon the arrival of officers from Oflag 64, in mid-April. Air Force officers from Nurnberg arrived on 19 April. 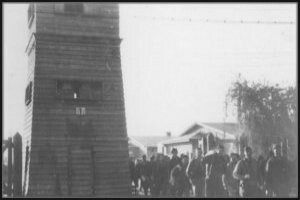 During the last 10 days of April, it was felt that all PW’S would be left in camps, following the agreement between the German Government and the Allies, and preparations were made accordingly. However, fear that the Germans would move PW’S to the Salzburg redoubt and there hold them as hostages was never absent. 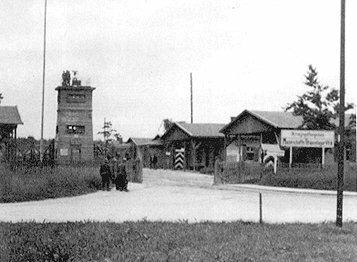 On 27 April, two representatives of the Protecting Power arrived at Moosburg, to attend and facilitate the transfer of the PW’S camp from German to American Authority. On the 28th, it was learned from Oberst Burger, the Commandant, that order was to be assured by assigning PW officers to various PW groups. Moreover, Col. Burger kept the entire German administrative staff in camp, as well as the complete guard staff. Col. Burger had not yet received, from the German military authorities, a reply to his question concerning the avoidance of fighting in the vicinity of the camp. The commandant asked the two Swiss to act as intermediaries between himself and the Men of Confidence. After a conference with the Men of Confidence, the two Swiss were recalled to the commandant. It appeared that the unexpectedly rapid advance of the American forces in the region, necessitated an immediate conference between the camp authorities ( represented by Oberst Braune) and the local German Army Corps commandant, in order to propose the exclusion of fighting from the Moosburg region. The proposal, made by Oberst Braune, and the Swiss representative, was accepted in view of Article 7 of the Geneva Convention. Appropriate instructions were given to the commander of the division in the sector in question, and the proposal was formulated for presentation to the advancing Americans. According to this proposal, an area of a few kilometers around Moosburg would have to be declared a neutral zone. At dawn on the 19th, The Americans and British Men of Confidence, the Swiss representative and an officer from the SS fighting division in the region, drove in a white Red Cross car to the American lines. They were stopped by two tanks commanded by a colonel, who drove them to the commanding general. After a long discussion with the German spokesman, the general declared the proposal unfavorable and unacceptable. The German returned to his divisional headquarters and the Swiss then drove to camp with the Men of Confidence. At 1000, immediately after their arrival, the battle started. The ensuing fight lasted some 2 1/2 hours, during which a shell hit one of the camp barracks, injuring 12 of the guards and killing one. PW’S remained calm although tank shots, machine guns and small arm fire could be heard. Half an hour after the fighting abated, Combat Team A of the 14th Armored Division appeared at the camp entrance. The guards, unresisting, were disarmed. PW’S burst out rejoicing, but did not try to leave camp. The supervision of the camp automatically went to the Men of Confidence and an official transfer did not take place. By instruction of the American military commander, part of the German administrative personnel remained at their posts. The remainder, including the guards, were taken as prisoners. The Swiss reported that treatment of German camp authorities and guards, by American troops, was correct. "SOURCE MATERIAL FOR THIS REPORT CONSISTED OF INTERROGATIONS OF FORMER PRISONERS OF WAR MADE BY CPM BRANCH MILITARY INTELLIGENCE SERVICE AND REPORTS OF THE PROTECTING POWER AND INTERNATIONAL RED CROSS RECEIVED BY THE STATE DEPARTMENT (Special War Problems Division)." Taken from the general introduction to camps.